The capsized Japanese light cruiser Oyodo at Kure, Japan. One of the light cruiser classes in the Imperial Japanese Navy was the Oyodo class (大淀 ). This class was constructed during World War II and in spite of the fact that it has the rank of class, there was only one vessel completed and commissioned. It was called Oyodo by following the common rule of naming light cruisers to rivers in the Japanese Navy. The Oyodo light cruiser had an interesting history, in both operational and command levels. First, it was designed to play roles limited to submarine operations but finally the ship became the flagship of the entire Combined Fleet. The vessel was finally sunk by aerial attack of american forces at Kure, in July 1945. 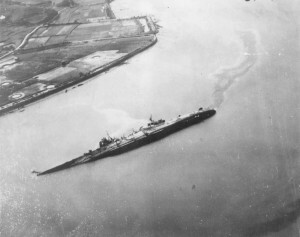 By following the IJN doctrine of submarine warfare, the cruisers should operate reconnaissance using the floating-aircrafts for the long-range submarines. These submarines could get benefited by the searched information. This role was planned to performed by the Agano-class cruisers, however, technical problems prevented them to be operated with this role and by late 1930s, the IJN requested seven cruisers to support this strategic long-range operations. The funding for the first two ship were assigned and approved under the 4th Replenishment Program of the IJN. However, further delayed caused that only the Oyodo was laid down, while the works for the Niyodo were never completed. By that time, the strategic concept of the war changed dramatically and the IJN was completely diverted to the construction of aircraft carriers, and not enough shipbuilding yards were available for maintaining the light cruiser ambitious program. The Oyodo resembled the design of the Agano-class cruiser but was enlarged. With less protection, it had notably differences in weaponry. Four sets of Kampon geared turbines represented the propulsion system which was more powerful than that of the Agano-class, and which provided a maximum speed of 35 knots and an actual range of 10,500 nautical miles (19,400 kilometres). The main armament consisted of six 155 mm (6.1inch)/60 cal. 3rd Year Type guns in two triple-gun turrets. The guns were initially planned to be deployed for the Mogami-class cruisers but their guns were finally replaced with 203 mm with twin turrets. Therefore, the Oyodo was assigned to have the initially 155 mm guns. They were of course strong and fair good weapons for surface combat. However, limited elevation posed serious problems for being used as AA roles. For this purpose, the Oyodo had specific heavy AA battery comprised eight 100 mm/65 calibre Type 98 guns in four twin mounts. They were planned to be deployed in the future B64-class cruisers but they were never constructed. The Akizuki-class destroyers also had the same weapon for AA roles.The performance of this weapon was excellent, and it is considered to be the best Japanese heavy AA gun of the war. Perhaps the main drawback was its short service life as its high velocity (1,000/ms) and fast rate of fire (up to 20 rounds per minute) made them run out of ammunition quickly. The rest of AA armament consisted of the 25 mm/60 caliber Type 96 AA gun, which was based on a French Hotchkiss design but was a very mediocre AA weapon with a low effective rate of fire, slow elevation and training, and lack of effective remote power control. The only class of cruisers in the Imperial Japanese Navy without torpedo tubes! The main armament was all located forward of the superstructure, much like the Japanese Navy’s own Tone-class heavy cruisers. Like the Tone class, the Ōyodo-class ships were intended to be scouting cruisers and hence the entire deck of the ship aft of the superstructure was devoted to aircraft facilities. Interestingly because of this anti-submarine and scouting role, no torpedo tubes were fitted. The Oyodo class was unique because was the only class of cruisers in the Imperial Japanese Navy without this weapon system. The floatplane E15K1 ‘‘Shiun’’ floatplane (Allied codename “Norm”) was planned to perform reconnaissance for the submarine flotilla in areas where the enemy had air superiority. However, some problems prevented it to work as designed so only four planes were in service by 1942. A total of fifteen were completed in total. They were operated in two main groups. A first group of six units was sent to Palau where Oyodo was operating for operational testing. Despite a more powerful engine, the performance of the E15K1’s (being about 500 kg heavier than the more common Aichi E13A1 “Jake”) was poor and they were quickly lost to attacking fighters. This severaly influenced the production plans and the entire E15K1 program was stopped in early 1944. From the Oyodo never operated more than two aircraft, and even the hangar was reduced after some refits which prevented her to operate a larger number of planes. Japanese cruiser Oyodo in 1943. Military photograph.